At Nimble, we’re focused on helping Microsoft Windows and Office 365 businesses grow relationships that drive revenue. That’s why we’ve launched our award-winning Nimble Contacts App for the Microsoft Edge browser that delivers instant social business insights on people and companies. Our core goal at Nimble is to be the centralized place for your contacts, communications, calendars, and business insights for your company. We do this by combining all of your Office 365 contacts, emails, calendars and social into our Social Sales and Marketing CRM, and people, such as CMS Wire and On MSFT, are taking notice of what a big impact this could have in the CRM space. Nimble is the first Social Sales and Marketing CRM that works for you by building your CRM from your existing Office 365 data and then works with you, everywhere you engage. We’ve optimized Nimble to work seamlessly inside Office 365, Outlook, Skype and even Dynamics CRM. We help you easily deploy your CRM by syncing your team’s Office 365 contacts, emails, and calendars into a unified relationship manager enriched with the business insights you need to engage. 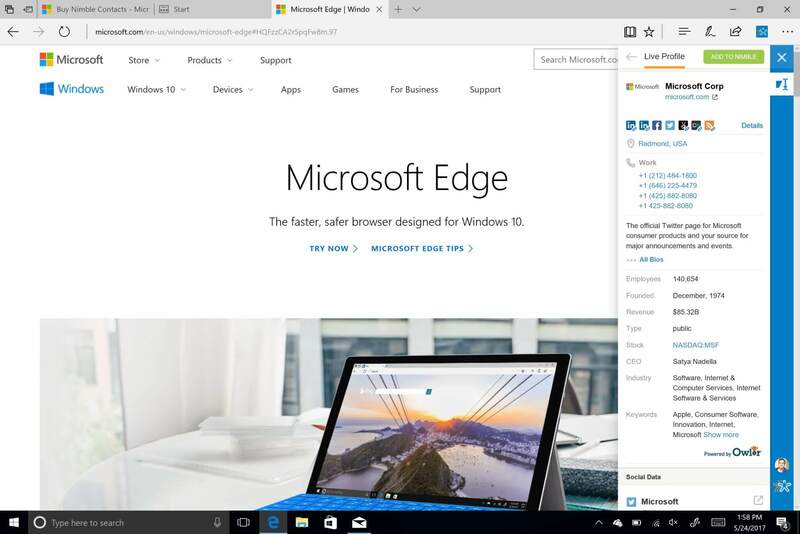 How does it work with Microsoft Edge? Our Nimble Contacts App extension for Microsoft Edge lets you use Nimble everywhere you work on the web. 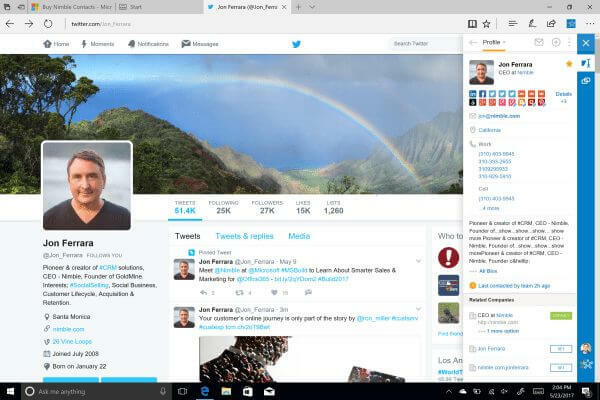 Hover over a contact to view social profiles, streams, and signals related to that person or company from a single screen. The extension automatically pulls and displays your complete communication history of social messages, emails, notes, and events for every contact in Nimble. 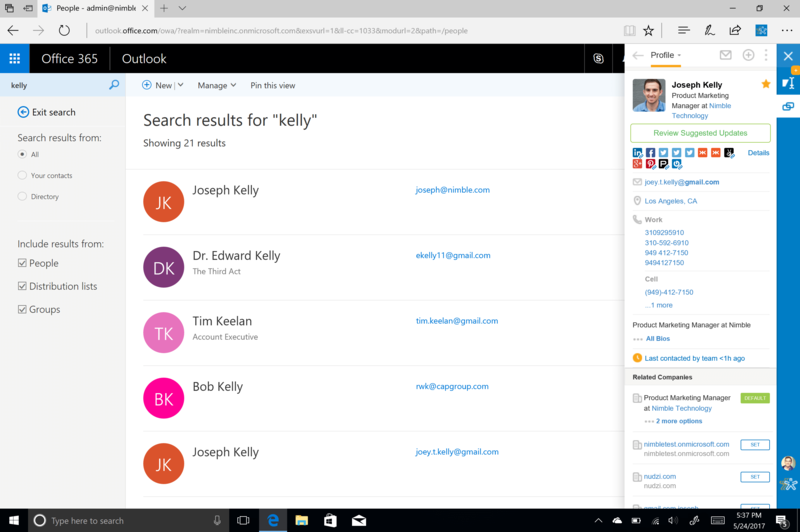 Nimble delivers a unified contact record with emails and calendar history and detailed people and company business insights inside of Office 365 contacts, email and calendar tabs. One of the greatest things about our Nimble Smart Contacts App for Microsoft Edge is that you can access Nimble while you engage on any social site like Twitter, LinkedIn, Facebook, Instagram, Google+, AngelList, Crunchbase, and more. Simply hover and discover with your cursor to see insights and set follow-ups with our extension. The Nimble Contacts App lets you hover over any text or URL to bring up a related Nimble record to set follow-up tasks, or you can see insights on new contacts. Simply open the Nimble Contacts extension while visiting a website URL and Nimble will display a live profile with insights such as location, title, phone number, CEO, revenue, founding date, industry, company keywords, and # of employees. 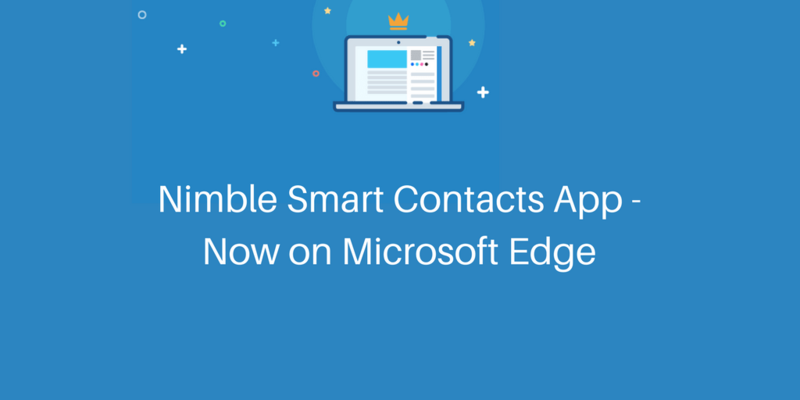 Learn more about the Nimble Contacts App for Edge on our FAQ. Nimble is the first Social Sales and Marketing CRM that works for you everywhere you engage in the Microsoft Business Suite: inside Office 365 & Outlook desktop, Outlook Mobile, Microsoft Teams, and Dynamics CRM. We build your CRM for you by connecting your team’s Office 365 contacts, emails, and calendars into a unified relationship manager enriched with the business insights you need to effectively engage. Learn more about our Nimble Add-ins for Microsoft Outlook here and for iOS here. Try Nimble free for 14 days at www.nimble.com. Business accounts are offered at $25 per license, per month. All of the new Nimble 4.0 features mentioned above are available within the current Business version of Nimble. Nimble has extended its pioneering Social Relationship Management Platform to work everywhere their customers work. Nimble delivers relationship insights everywhere you work including G Suite, Outlook, Chrome, Safari, Firefox, Hootsuite, iOS and Android.